The first one was a success, so here we go again. 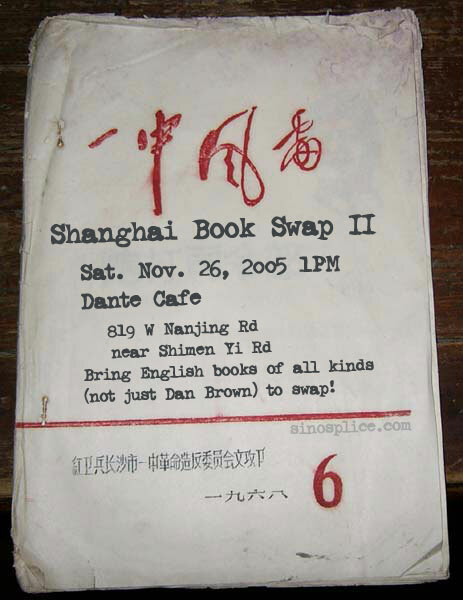 The second Shanghai Book Swap happens this Saturday. Be there! Sounds like fun. I remember living abroad and, not having anything better to do, read a lot of books I would NEVER have read stateside. Pompous novels like Paul Auster’s Leviathan and that book by Jon Krakauer about that retard who starved in the forest. I remember reading Memoirs of Geisha in Nanjing of all places. I wonder if that book’s popular in China, both among the Chinese and laowais. It’s a good novel but rather overrated. Why swap ’em if you haven’t read ’em? Is this just a book swapping exercise or an opportunity to get some books that you haven’t read yet, but WILL? How far along have you read God’s Debris? Do you recommend it? Thanks. I can swap books I might read if I have time for books I definitely want to read (and will make time for… or won’t swap away). I’m about half way through. It’s pretty interesting. Sort of reminds me of Richard Bach’s Illusions: Adventures of a Reluctant Messiah. You might want to read the opinions posted on Metafilter. Some of those critiques are good, although I suspect a lot of the commenters on there are just trying to make themselves look smart. Don’t know why, but never pictured you as reading Memoirs of a Geisha. John, can you hurry up with those Nancy Drew books? I need them back soon. Why not? Chick books are very cool. In fact, I wrote my MA thesis on The Bridges of Madison County. (And no, that’s no joke.) I’ve been analyzing bestselling novels for five years now, and they’re often chick books like Memoirs of a Geisha and The Horse Whisperer. My criteria for reading fiction: if it made the author a ton of money, I’m going to read it, be it The Da Vinci Code or The Notebook! Will anyone sell old books? Please contact me at shenginshanghai@hotmail.com. If I ask a question in a wrong place, I’m sorry .